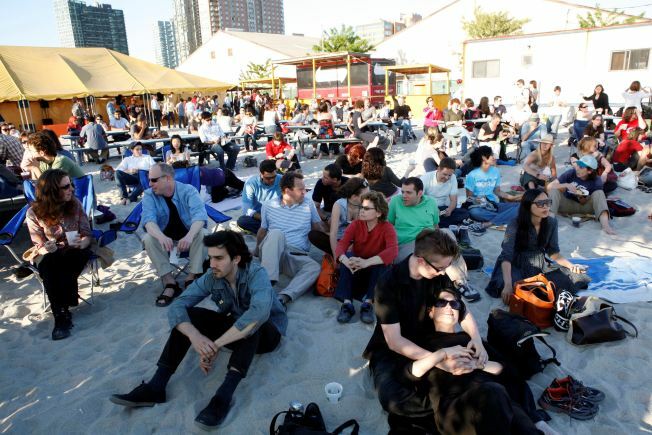 Manhattan could get two new "beaches"
The Water Taxi Beach in Long Island City -- which hosted an event for the World Science Festival in 2008 -- may franchise. The New York Water taxi may open two more in Manhattan. The New York Water Taxi Monday announced it's completed its acquisition of the Circle Line Harbor Cruises and said it's exploring the possibility of opening two more waterfront beach areas this spring or summer. NewYorkology is reporting both locations under consideration are in Manhattan, but company officials would not say where in Manhattan. The locations could be accessed by both, and are among several locations that could be added to the New York Water Taxi's summer schedule, including Governor's Island, Rockaway Beach and Sandy Hook, N.J., a company official told NewYorkology. As part of the NY Water Taxi's purchase of the South Street Seaport-based Circle Line, a new company -- Harbor Experience Companies -- was created to oversee the two ferry companies as well as the existing Water Taxi Beach in Long Island City. Circle Line Harbor Cruises, which is also known as Circle Line Downtown, will keep its name and a schedule close to what it's offered in the past. That means there will be no end to the confusion over the Circle Line names, which is so confusing it even has its own confusing Web site. Circle Line Sightseeing, also known as Circle Line Uptown, is headquartered on the Hudson River at 42nd Street, and has nothing at all to do with the Water Taxi/Circle Line Downtown operations at the South Street Seaport on the East River.